Hello! How are you guys? It was lovely to have a week off last week… I had planned on doing a Boden Bargains Sales pick post, but then I got all self-doubt-y and thought why on earth would anyone want to read that? And how patronising of me… and how many others have probably done a similar blog post? So in a ‘woe is me, who really wants to read my musings” low, I decided that taking a step back from myself and having a week off would be better than publishing a miserable blog post. Which I think was a good thing for me… and you guys! But here I am, back after that week off, kinda refreshed and raring to go… I’m talking “instpiration” this week… 7 things which I’m a-lusting after, have actually bought or indeed simply *want* to buy… all as a direct result of showing up on my Instagram Feed. The bedroom / bathroom renovations have started here in the Threads house – albeit to an incredibly frustrating slow start, but I’ve scarcely had time to think about online shopping, the net result of this household distraction & shopping deprivation is that I want pretty much everything ‘new’ I see from my Instagram. How fricking cool are these? First spotted on my lovely insta-pal Terri (@thestylecoop) who is a most fabulously stylish and utterly lovely Dublin based ‘insta-bloggers’ – she came across Miista whilst looking around Shoreditch on her recent visit to London. Now I was lucky enough to be in London over that same weekend, and met up with Terri for an afternoon… and it was as though we’d known one another for a great many years: and what I mean by that ISN’T that we poured our hearts out to one another… rather, it was just so very normal to meet, we shared similar ‘London working and living’ pasts and I very much hope to meet up with her again at some point down the line. Anyway, I digress… after we’d met up – Terri was having a mosey around Shoreditch and came across this independent shoe brand, and in true instagram “sharing is caring” fashion, she shared details of her new discovery. And I am currently hovering over the ‘complete purchase’ button. If you’ve been following me and my blog, you’ll know that I recently reached the conclusion that I’m a (floral) print free kind of dresser… but if you have been following for longer, you’ll know that I’m a bit of a magpie too. 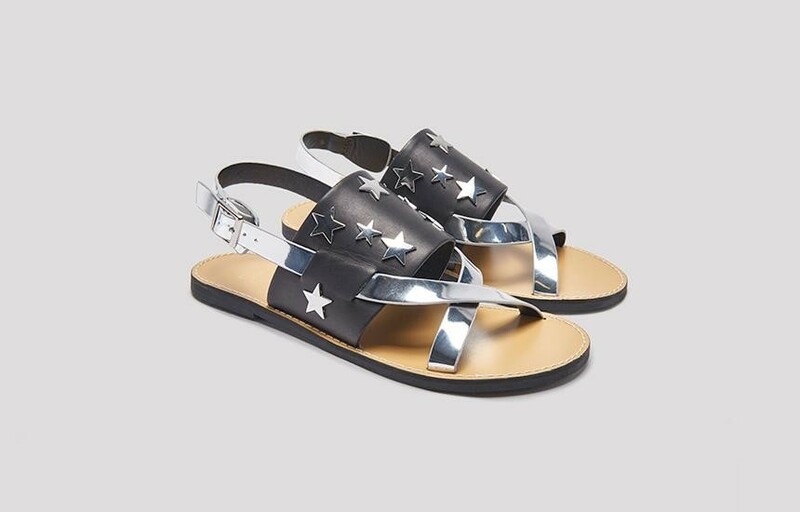 My love of metallics and stars is well documented so these Salome Black Silver Sandals are just too delicious really, aren’t they? 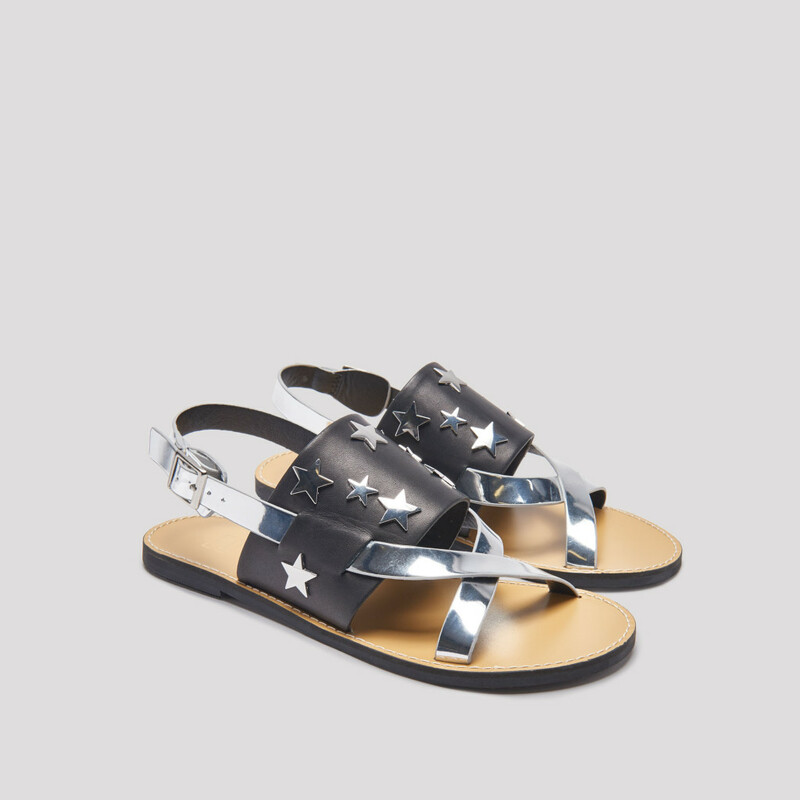 The only reason I haven’t actually bought them just yet is really because there are at least 4 other sandals / espadrilles I have my eye on from Miista and as usual, I’m struggling to make a decision. That and the fact that some of their New-In stuff is just lush. Too much stuff I want in fact. I really, really want this skirt: elasticated waist? check! Pockets? Check! Poppers? Check! I met up with a friend for coffee this week who was wearing this skirt & she looked so lovely in it! My friend is probably around the 5’4″ marker, and the skirt was just above the knee on her, so I figure it would just cover my knees which would be fine I think – if not, an easy hem to take up. 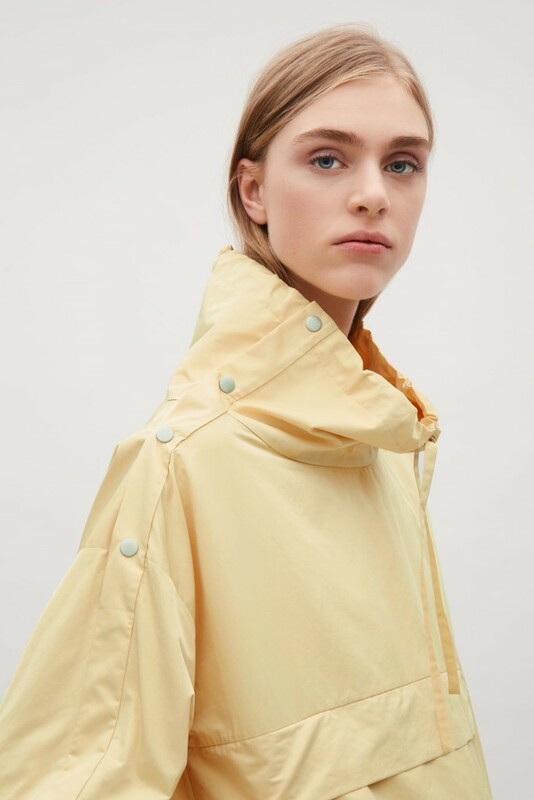 This particular anorak is pretty much identical in style to one I had in the early 2000’s which served me well during my V-festival going years. 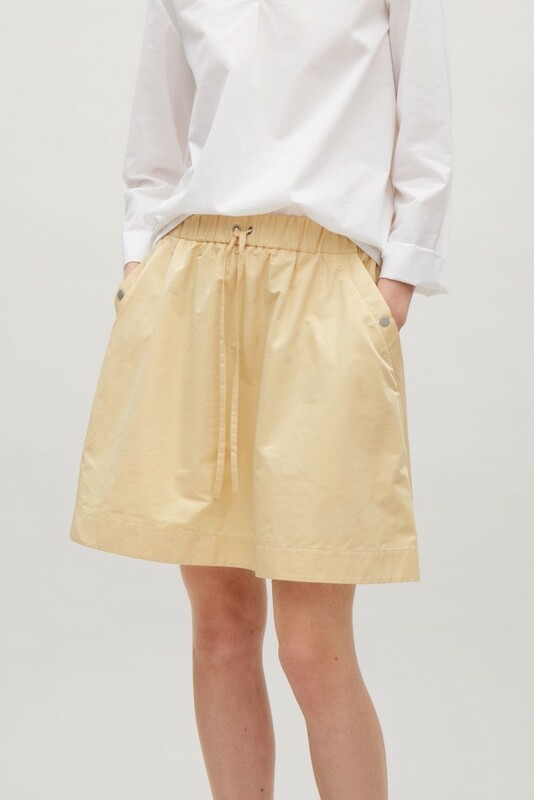 I’d originally clicked though to Cos after seeing this anorak, hoping to find it in other colours – unfortunately for me, it is only available in yellow but whilst this shade of yellow really doesn’t work against my face… the skirt would be just fine against my legs, broken up by another colour in the form of a tee or vest top. 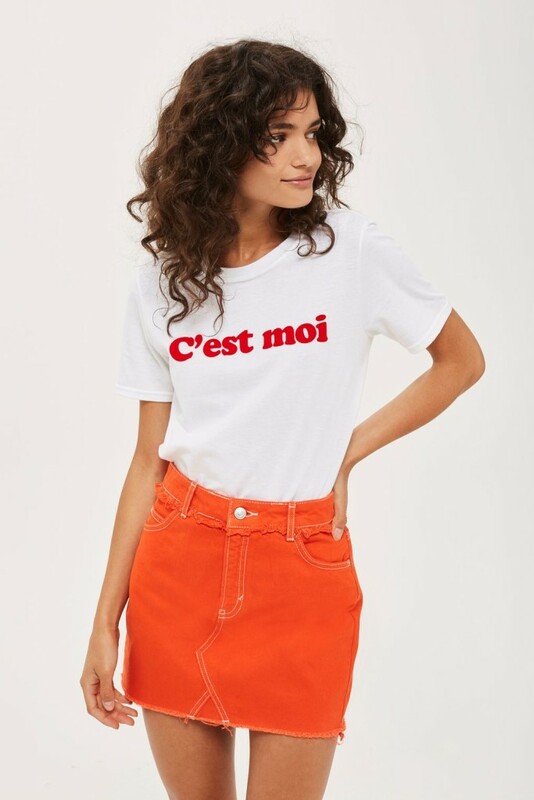 Sticking with skirts, I saw the beautiful Belle (@honeybelleworldblog) wearing this skirt on her Stories and I looked it up straight away… but then decided I’m a little too old for such a mini mini-skirt. However, after Belle posted a pic of herself on her main Instagram feed… I have added the skirt to by basket. The skirt would be slightly longer on me after all, wouldn’t it? However, I already have two denim skirts (a modest collection of one blue and one black…) and honestly, I’m just not sure how often I’d wear this one? It’s this glorious sunshine we’ve had this week which is making me seek out all the summery brights. So I think I’ve posted about wanting to buy the Cult Gaia Bamboo bag before? Which goes for in excess of £100, and seems to be permanently sold old / wait listed? Well, the brilliantly frugal Michelle (@myfashionable40s) only went and found a budget version from eBay and blogged about it here sharing her shopping experience as well as the bag. Having seen Michelle recently at the Lucky Things meet up in Bristol, I also got to check out this bag in the flesh: it’s a good size! In fact, I’d say it’s probably a little too big against my diddy frame, though I could get away with it for sure. 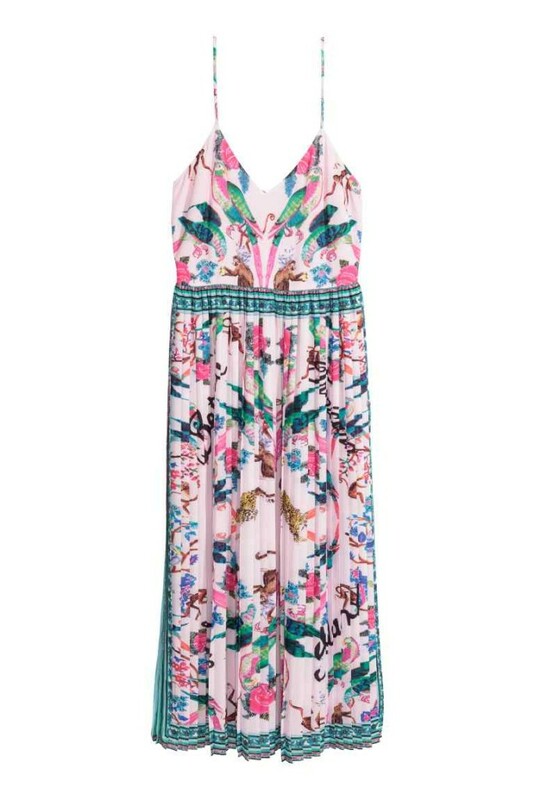 But, having hankered after a Dodo Bar Or dress for over a year now (think it was on my birthday wish list last year) I first order this dress at full price (£39) aware that it would probably be too big on me because the smallest size available was an 8. It’s also a weird shape. Quite sac like with what is effectively a big “frill” of a lower skirt. That said, it looked great with a belt on. Anyway, I decided that it wasn’t worth the money and I couldn’t be bothered to alter around the top which was too wide across my chest. I may have bought it *and* returned it a second time. And it started popping up all over my instagram feed. So I might have just bought it a third time and I am altering it… a short blog post on how I get on next week. Spotted this on a lovely new Insta-buddy (again, who I met at the Lucky Things Bristol meet-up) Debbie (@thefashionablepan) and she totally rocks it! Now, this dress isn’t in “my colours”, it would be a full-blown-maxi (and more) in length & I’m not big on florals or spaghetti straps… but go take a look at Debbie wearing it on her feed… it’s just beautiful. Well would you look at those! 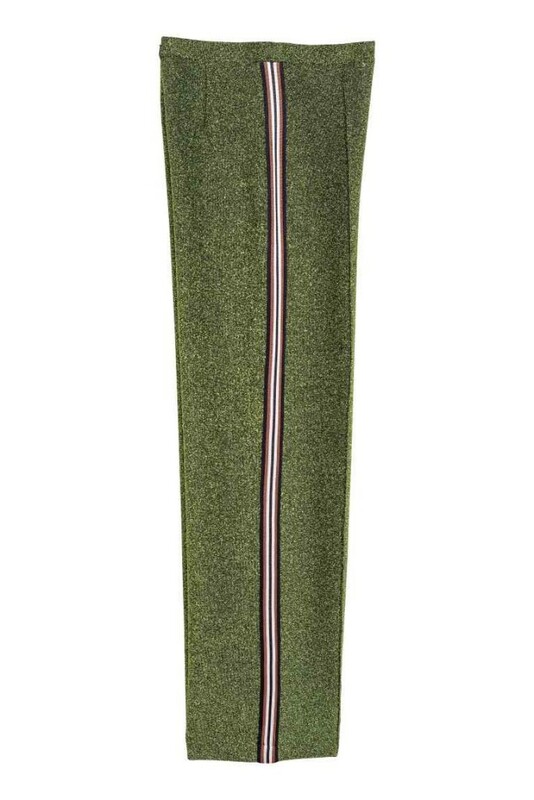 Glittery-lurex-fabric… a side stripe… I mean how very Gucci-not-gucci are these? I spotted these on Alex’s (@thefrugality) Stories on Thursday night (I think)… she was at a HM Home event, and another blogger who she filmed (Jasmine?! Sorry I can’t remember!) was wearing them. She then posted a still of Jasmine stating the trousers were from HM. 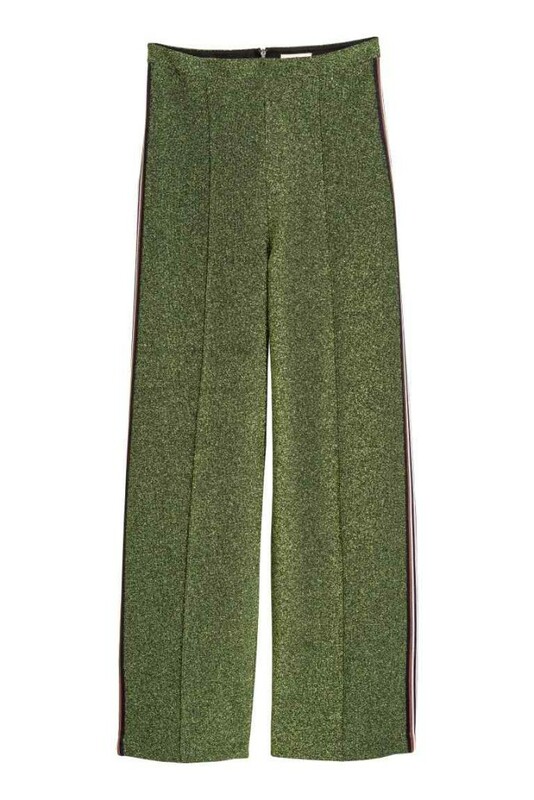 I then spent most of the Friday glued to the HM website checking to see if these trousers were available. Eventually in the evening they were – and I bought them in a heartbeat. The following morning I found out that both Alex and Erica Davies had linked to the trousers – so I felt like a bit of a muppet as I could have saved myself a whole bunch of effort/time! I’m glad I ordered when I did because the trousers are almost sold out online… however, I imagine they’ll be a lot of returns/re-stocked and that they’ll be available in bigger HM stores. Anyway, I absolutely adore these trousers… it’s love in fact. And with that in mind, knowing that green glittery trousers are not to everyone’s tastes, I’m going to cheat a little this week and make these trousers not just my number one, but my Stinker of the Week as well as my Wildcard of the week. They are glittery lurex for a start. And having not felt the fabric for myself, it’s difficult to know if they are made from a heavy, thick lurex which… well, can sort of “add” weight to the hip area; equally, they could be made from a light-weight, thinner lurex-y fabric which would pose different issues. Namely that a thinner fabric would show off absolutely every lump & bump right down to any dimply thighs. And I say this from experience of thinner weight lurex-style fabric trousers. 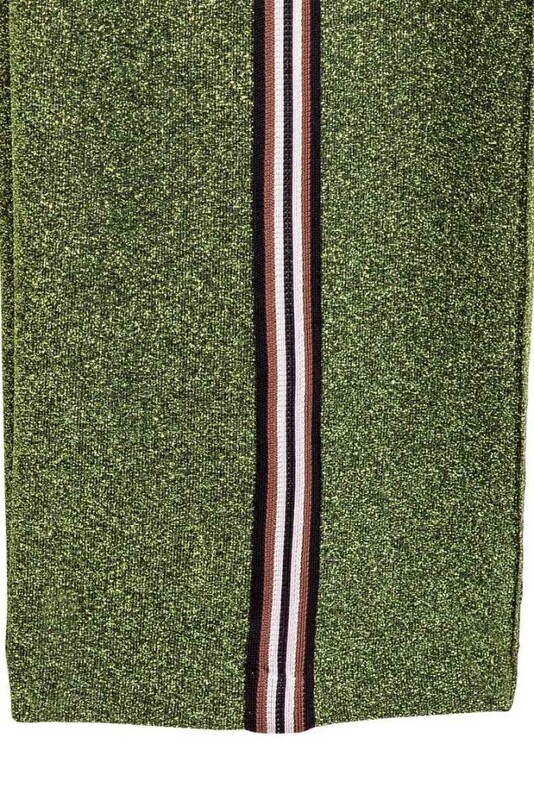 But another issue for us shorties is that a side stripe can often make us look very “toy soldier” like. So… although I do love these Glittery Trousers, and my inner magpie is totally sold on them: the proof will be in the pudding as to whether they love me back. So… looking at the close-up of the fabric of these trousers… they really are not going to be for everyone, are they? Given I’ve already ordered and am eagerly awaiting the arrival of my pair… how do I plan to wear them? Look 1 – Casual & Cool: I’m thinking a fresh, crisp, white shirt… half tucked in, half unbuttoned, big cuffs, something like this HM Cotton Shirt (reduced to £11.49) with my Veja Black Wata Canvas Pierre Sneakers (£70). Look 3 – Going Gucci: How could you not?! You could go totally clashy with a floral print silk dress over the top but I think I’d probably go with something like a bright pink shirt (HM £8.99) buttoned up all the way and tucked in, with a buttoned up, clashing fitted cardi (Boden, £69.30 – I’ve gone for a clashing green, but a deeper cerise pink would have been better), all belted over the top at the waist with a metal buckle belt (Mango £12.99) and finished off of course with some bling gold Gucci Metallic Mid-heel Pumps (£545). And of course you could go with some micro-fishnet or glitter socks. I know. It’s a full on look, not for the faint hearted. But… if you’re gonna go clashy-Gucci-inspired-crazy, you may as well go hell for leather! 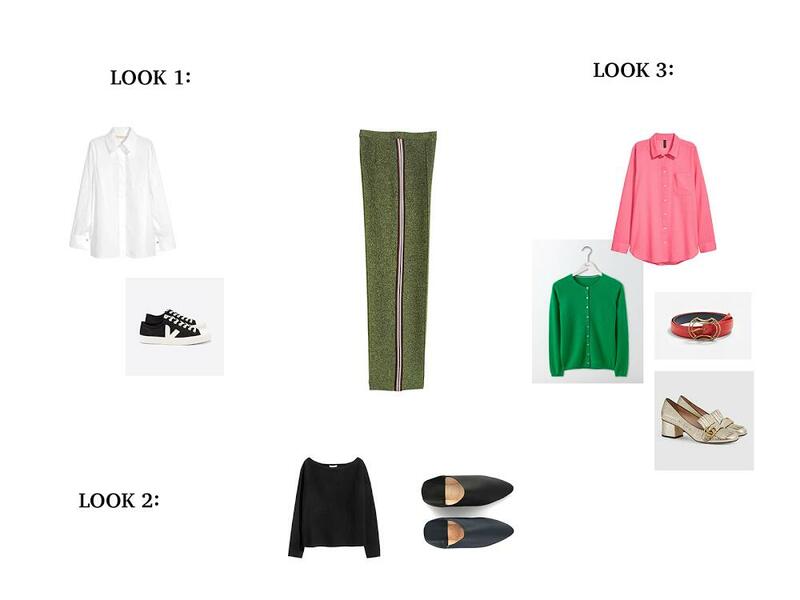 Those are some looks I could pull out from my current wardrobe – apart from a a fitted cardi as I’m woefully lacking in cardigans full stop. I think the trousers would also look great with a big baggy (bright pink!) sweatshirt and some good old adidas stan smiths, which would probably be my more day-to-day look… if the trousers work on me of course! And what kind of bags? Well, you could go for anything really… I saw a lovely basket-weave metallic gold clutch in-store at HM (not online yet), but all the looks would work just as well as a more formal short strap bag like this Reiss Bleeker Bag, and of course a bright red cross body bag would look fab. But it’s “outerwear” I’m struggling to visualise. So, it’s over to you: what jackets / coats would you go for? As mentioned earlier, I hope to update you later in the week with my Red Herring dress alterations – tie then, have a good week! Mwah! Thank you for the lovely mention Bean! The homage to the Cult Gaia bag is a goody isn’t it! Who wants to pay over the odds for something that is likely to be a one season wonder?! I’m all for investing in classics but I’m so happy to have found my bargainous trend version on eBay! Always happy to share my good fortunes too! Oh you’re welcome Michelle & thank YOU for the tip off about the bag. 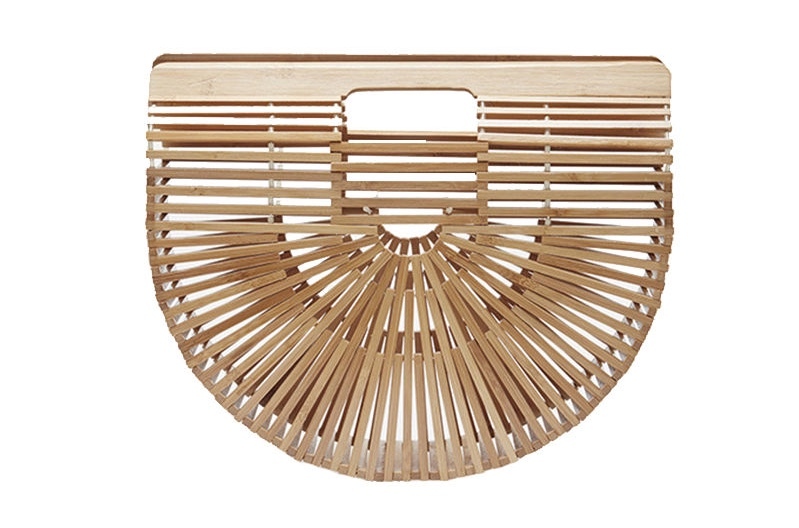 Hope they’re not a one season wonder – the bamboo bag seems to have garnered cult-status? !